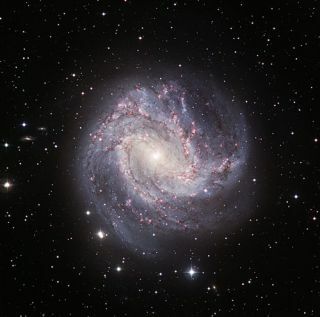 ESO's Wide Field Imager has captured the intricate swirls of the spiral galaxy Messier 83, a smaller look-alike of our own Milky Way. Shining with the light of billions of stars and the ruby red glow of hydrogen gas, it is a beautiful example of a barred spiral galaxy, whose shape has led to it being nicknamed the Southern Pinwheel. Strange magnetic fields floatingin distant expanses of space may help explain how galaxies end up being somagnetic, a new study has found. Almost all galaxies have magnetic fields, but where theycome from has been a mystery. Now astronomers have observed evidence of weakmagnetic fields that could hold the answer. "Basically we have found some magnetic fields which arein the middle of nowhere, outside galaxies and galaxy clusters and all otherknown structures," said researcher Andrii Neronov of the GenevaObservatory in Switzerland. "People have suggested that such fields shouldexist on theoretical grounds, but they have never been detected before." Scientists think fields like these could be the precursorsto the magnetic fields inside galaxies.But researchers still don't know how these first fields originate. One idea suggests that they are created by protogalaxies,which are collections of matter on their way toward becoming galaxies. Butanother theory contends that the small magneticfields are created even earlier, shortly after the birth of the universe. The new observations favor this second idea, Neronov said. In fact, Neronov and his team didn't so much see thesefledgling fields, but rather the absence of certain kinds of light ? which suggeststhey are there. The astronomers used the FermiGamma-ray Space Telescope, which was launched into Earth orbit in June2008, to search for gamma-ray light coming from the hot plasma that floatsbetween the galaxies ? a material called the intergalactic medium. The researchers saw less of this radiation than theyexpected in places, which means that magnetic fields are likely deterring someof it. "At the moment we have seen some negativeeffects," Neronov told SPACE.com. "We have seen some features whichare due to the absorption of gamma-rays from distant sources." Right now, there is still much uncertainty to theirmeasurements, but the astronomers hope to collect more data to build up abetter picture of these mysterious fields and how they act within galaxies. The researchers report their discovery in the April 2 issueof the journal Science.